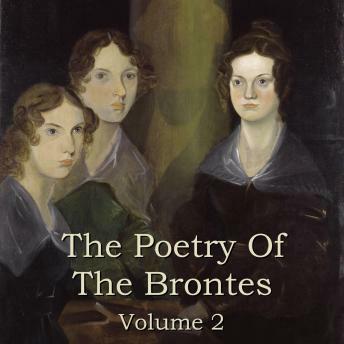 The Brontes - Volume 2. Perhaps England's greatest literary family. To find one brilliant novelist in a family is extremely rare. But two? Three? The Bronte sisters, Charlotte, Emily Jane and Anne together with their brother Patrick are famed throughout the World. But amongst their many talents was poetry. Of course being Bronte's they were rather good at that too. In Volume 2 we bring you; Emily Bronte - Remembrance, Anne Bronte - Lines Composed In A Wood On A Windy Day, Patrick Branwell Bronte - Death Triumphant, Anne Bronte - Appeal, Anne Bronte - The Captive Dove, Patrick Branwell Bronte - Oh God While I In Pleasure Wiles, Emily Bronte - A Day Dream, Emily Bronte - Sympathy, Anne Bronte - Despondency, Anne Bronte - In Memory Of A Happy Day In February, Emily Bronte - Plead For Me, Charlotte Bronte - Evening Solace, Patrick Branwell Bronte - Peaceful Death And Painful Life, Anne Bronte - Lines Written From Home, Emily Bronte - How Clear She Shines, Patrick Branwell Bronte - Thorp Green, Emily Bronte - Methinks This Heart, Anne Bronte - The Bluebell, Anne Bronte - Lines Written At Thorp Green, Patrick Branwell Bronte - Penmaenmawr, Emily Bronte - The Night Wind, Charlotte Bronte - He Saw My Heart's Woe, Anne Bronte - Dreams, Anne Bronte - Last Lines, Patrick Branwell Bronte - Epistle From A Father To A Child In Her Grave, Emily Bronte - How Still How Happy, Emily Bronte - Shall Earth No More Inspire Thee, Charlotte Bronte - On The Death Of Emily Jane Bronte, Charlotte Bronte - On The Death Of Anne Bronte. These poems are read for you by the very fine Anna Bentinck, David Shaw-Parker, Eve Karpf and Jo Wyatt.